Summative assessments, or high stakes tests and projects, are what the eagle eye of our profession is fixated on right now, so teachers often find themselves in the tough position of racing, racing, racing through curriculum. But what about informal or formative assessments? Are we putting enough effort into these? Informal, or formative assessments are about checking for understanding in an effective way in order to guide instruction. They are used during instruction rather than at the end of a unit or course of study. And if we use them correctly, and often, yes, there is a chance instruction will slow when we discover we need to re-teach or review material the students wholly "did not get" -- and that's okay. Because sometimes we have to slow down in order to go quickly. What this means is that if we are about getting to the end, we may lose our audience, the students. If you are not routinely checking for understanding then you are not in touch with your students' learning. Perhaps they are already far, far behind. We are all guilty of this one -- the ultimate teacher copout: "Are there any questions, students?" Pause for three seconds. Silence. "No? Okay, let's move on." Ever assign the big project, test, or report at the end of a unit and find yourself shocked with the results, and not in a good way? I have. The reason for the crummy results is not the students, but a lack of formative assessments along the way and discovering when, where, and how certain information needed to be re-taught or reviewed. If you find yourself wanting to spring a "gotcha" quiz on your students, ask yourself if it is really meant to collect important data or to freak them out and maybe "get them more serious about paying attention"? If you feel tempted to do this, just say no; it's a mistake. Formative assessments are not about gotcha-ing students but about guiding where instruction needs to go next. We should use them frequently, and while or after kids learn a new idea, concept, or process. When you are on your way to the Big End Project (or summative assessment) and students have just learned a piece or a step toward the end, check to see if they've got it. These can be fun and not daunting, for students or teacher. Give students a question to answer that targets the big idea of the lesson, and have them write a sentence or two. Stand by the door and collect them as they leave. Sit at your desk and thumb through them all, making three stacks: they get it, kind of get it, and don't get it all. The size of the stacks will tell you what to do next. Give your students a checklist and have them self-assess. Collect the checklists with each, or every other, new idea during a unit of study. Make sure they write a sentence or two explaining how they know they've got it, or why they think they are still struggling. This is more involved than the exit slip and often times, I'd give the kids more than three minutes. I don't use the word "essay" or they get too nervous. I might say, "Take out a piece of paper, and tell me what you have learned so far about ____________." Often they will basically write an essay (something they usually labor over in drafts and on their own!) I assess these the same way as the exit slip, by making the three stacks. Ask students to write a summary sentence that answers the "who, what where, when, why, how" questions about the topic. Provide students with common or predictable misconceptions about a specific principle, process, or concept. Ask them whether they agree or disagree and explain why. Also, to save time, you can present a misconception check in the form of multiple-choice or true/false. Simply observing the actions, behaviors, and words of students can provide a wealth of valuable data and serve as a formative assessment. You can take notes as they conference with one another, pair and share, or engage in collaborative learning groups (lab projects, literature circles, etc.). What to look for? If there are small group conversations happening, and they are successfully applying the new learning, not just one student is talking; they are talking over each other, and they are animated with body, hands and eyes. On the other hand, if it is quiet during this talk time, and they are watching you watch them, they are most likely lost. 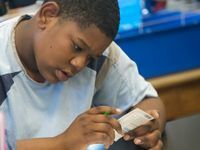 Your note taking can be as easy as making a check-plus mark after each child's name who shares something of value and on-target/topic with their group. (Put a check by each child you hear share so you can see how many you heard versus how many get it.) If I have 17 names with checks after them, but only four check-plus marks, it's time to review or re-teach. How do you check for understanding with your students? What are some formative assessments that you find fun, engaging, and effective? Please share with us your thoughts, ideas and expertise!